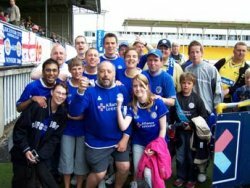 Leicester’s travelling supporters at the Lillestrom game. The Leicester squad on their first day of training in Bodo. 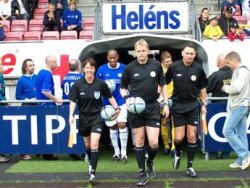 Leicester City’s six-day pre-season tour of Norway was arranged by PSC and included two friendly games against teams from the Norwegian Premier League, Bodo-Glimt and Lillestrom. Leicester spent the first four days of their trip based at the Radisson SAS Hotel, Bodo, ideally based 5 minutes from the airport and 5 minutes from Bodo’s excellent training facilities which included outdoor pitches, indoor pitches and the full use of a state of the art gymnasium. After their victory over Bodo-Glimt, they travelled down to Oslo where they spent the remaining two days in Oslo which included a game against top Norwegian side Lillestrom. Leicester City players met over 200 local children from Bodo in a specially arranged community signing session at the £9m indoor sports complex in Bodo.